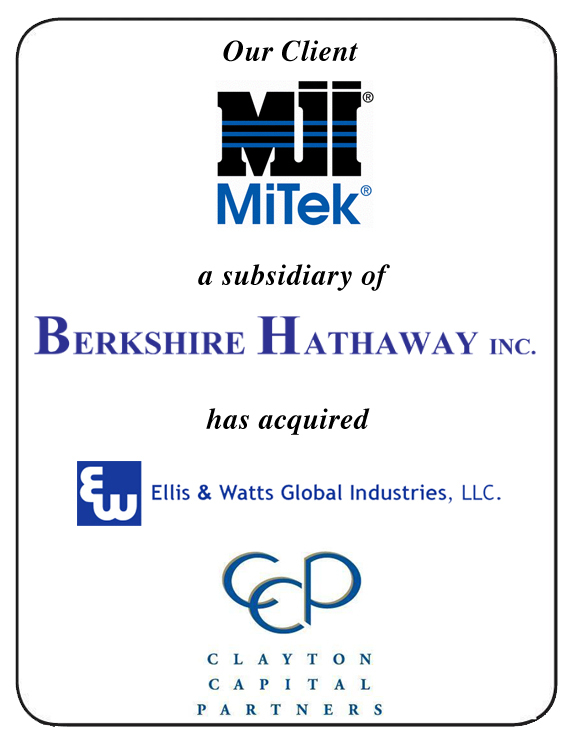 Clayton Capital Partners is pleased to announce the purchase of Ellis & Watts Global Industries, LLC by its client, MiTek a subsidiary of Berkshire Hathaway, Inc.
Ellis & Watts Global Industries, LLC (www.elliswatts.com) based in Batavia, OH, is the recognized leader in the engineering, design, and fabrication of highly customized HVAC and other products sold into the nuclear, military, and other industrial end markets. MiTek (www.mitek-us.com) based in Chesterfield, MO, is a diversified global supplier of engineered products, software and equipment to the residential and commercial construction, and industrial end markets. Berkshire Hathaway, Inc. (www.berkshirehathaway.com) based in Omaha, NE, is an American multinational conglomerate holding company.